This month join the French #winophiles, a group of French wine loving friends, as we tour Burgundy featuring Chablis and the Côte d’Or. Join the conversation every third Saturday on Twitter at 11:00 a.m. EDT using hashtag #winophiles. Last fall I visited Burgundy for the first time. Already a fan of Pinot Noir, I had no idea just how hard I would fall for the wines of Burgundy. My tour started in Beaune, the village known as the wine epicenter of Burgundy. I immediately felt at home in Beaune. It was easy to wander the walled village and not get lost. Beaune had a real agrarian atmosphere surrounded by vineyards with the focus on food and wine. I visited Domaine Chanson, Prosper Maufoux, Domaine Famille Picard and Joseph Drouhin, learning about and tasting the celebrated terroirs, known as climats that are unique to Burgundy. Climat being the precise plot of a vineyard that creates a wine with a distinct personality. [“Discovering the Vineyard climates of Burgundy”, Youri Lebault Bourgogne Gold Tour] The wines of Burgundy were not heavy but delicate, refined, complex, emerging slowly with layers of flavors and lingering on my palate and in my head. The Pinot Noirs and Chardonnays of California and Oregon were different and the concept of climat or terroir became crystal clear. And then there was the food. Dinner was an all night affair with courses prepared with fresh local ingredients carefully paired to the wines of Burgundy. Often the courses were not elaborate, but fresh and simple, presented in an artistically French way. While I was there I took a cooking class at The Cook’s Atelier see the details in an earlier post here. The Premier Cru Saint-Aubin was a wine I tasted and purchase while in Burgundy. Map of Saint-Aubin, Saint-Aubin is an appellation of the Côte de Beaune region (Côte d’Or). 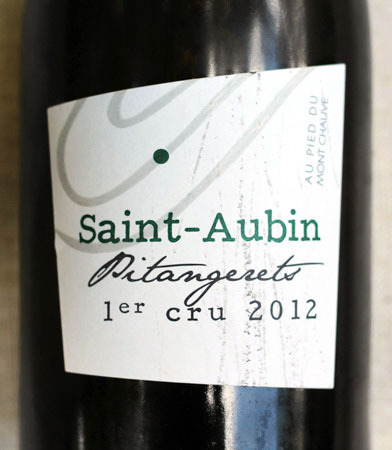 Pitangeret is one of 30 climats classed as Premier Cru in Saint-Aubin. 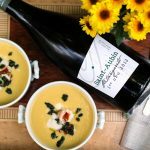 I thought it fitting to pair the wine with a simple but elegant Corn and Lobster Chowder. Tasting Notes A bright pale straw color with an enticing honeysuckle nose. Light to medium on the palate, nicely balanced with citrus, apricot and mineral notes. A beautiful lingering finish of toasted nuts and honey. Pairing Notes The Corn and Lobster Chowder is a light version made with cashew milk and vegetable broth. 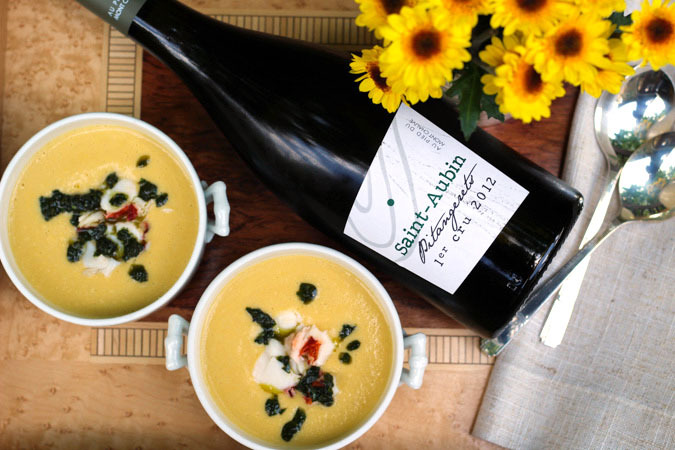 The lightness of the soup compliments the weight of the Saint-Aubin. The lobster is a classic pairing with Chardonnay and fits the distinctiveness of the wine. The cashew milk is echoed in the nutty flavors of the wine. The rustic basil oil with its herbal/earthy notes highlight the acidity in the wine. The fresh corn is an endorsement to the Burgundian culture of appreciating seasonal fresh produce. A light version of a summer classic. Pair with a lightly oaked Chardonnay. Makes an elegant first course. In a large soup pot, heat 2 tablespoons of extra virgin olive oil over medium high heat. Add the onions and sauté, stirring until translucent and slightly golden, about 5 minutes. Add the corn, stir to mix. Add the vegetable broth and increase heat to high and bring to a boil. Cover the pot and lower heat, simmer for 5 minutes. Add the cashew milk and salt and pepper. Stir and simmer for another minute. Turn off heat. If the lobster tail is frozen, steam the lobster tail until the shell just turns red about 8 minutes. Pre heat broiler. Place lobster tail on a baking sheet. With a kitchen shears, cut the top side of the lobster shell lengthwise. Pull apart shells slightly, season with salt and pepper. Broil for about 8 minutes or until lobster meat is opaque. Cool and remove tail from shell. Cut into bite size pieces. In a mini food processor, process the basil leaves until finely chopped. Add 1/4 cup olive oil and process again to combine. In a Vitamix or other powerful blender, puree the soup in batches. Return the mixture to the soup pot. Stirring and warm up over low heat. Serve soup in bowls garnished with lobster meat and a drizzle of basil oil. Check out my fellow French #winophiles and their adventures in Burgundy. 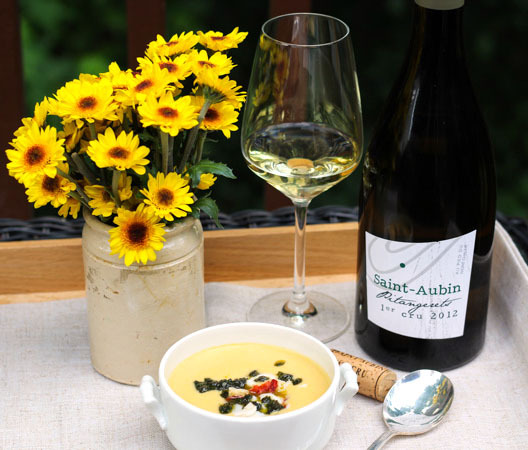 Your soup and pairing with the Saint-Aubin (a personal favorite 😉 sounds delightful Jane. I especially like the use of cashew milk and the nutty component it brings. I’ve grown to love the Chardonnays of this area- as you say their layers of flavors- and look forward to trying another one with your soup! Thanks for sharing your visit in Beaune, I love it, too! We get some wines from St. Aubin here in Minnesota and I have enjoyed several – they’re more affordable than the big name villages! Sounds like your trip to Burgundy was extraordinary, Jane! As for your pairings, both the wine and food look delicious. I’m definitely going to try the soup recipe – perfect for summer. I loved traveling along with you for a moment since I have yet to visit Burgundy. Your recipe and wine pairing sounds divine. I will definitely save this recipe and make this someday! Thanks for sharing your visit to Burgundy. It sounds lovely. By all counts it seems as if they wines are not as expensive there are they are here. Guess I’ll have to go and find out for myself!